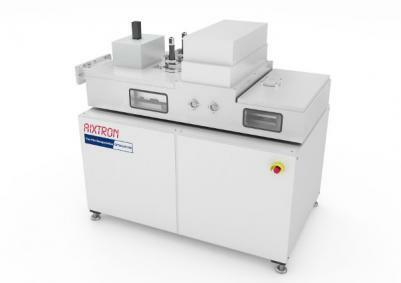 A few months ago Aixtron acquired US-based thin-film encapsulation (TFE) developer PlasmaSi for $16 million, and today Aixtron announced that they have sold the first Optacap-200 encapsulation tool to a major Asian display manufacturer. The R&D system was ordered in Q3 2015 and will be delivered in Q1 2016. The OptaCap-200 is a standalone R&D system that substrate sizes of 200x200 mm. This is a plasma-enhanced chemical vapor deposition (PECVD) technology that can be used to deposit highly flexible and effective barrier films for thin-film encapsulation for OLED and OPV panels. When Aixtron acquired PlasmaSi, it aimed to combine the encapsulation technology with its OVPD OLED deposition equipment, and to integrate the process into its existing OLED cluster for customer demonstration purposes. Encapsulation is one of the major challenges towards flexible OLED mass production. There are several competing TFE technologies, including ALD (Veeco's Fast-ALD, for example), Inkjet Printing (Kateeva's YieldJET Flex, for example) and Universal Display's UniversalBarrier. Samsung (which is certainly a leading Asian display maker) has been experimenting with all three encapsulation technologies described above (Fast-ALD, YieldJet, UniversalBarrier) in its quest to find the best technology for its flexible OLED production. I wouldn't be surprised if Samsung is indeed the major producer that ordered this R&D system.